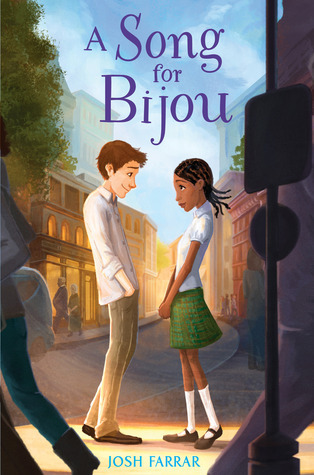 What it's About (from the book jacket): From the moment Alex Schrader sees Bijou Doucet, he knows that she is the girl for him. So what if his friends would rather goof around and play video games? Alex must win Bijou's heart. When Bijou meets Alex, she can't believe a boy would even talk to her, let alone ask her out. Recently moved from Haiti after the devastating earthquake, Bijou is still adjusting to the drastic differences of life in America--life that includes a new school, new friends, and, now, even boys. It will take the help of great friends and a grand plan to make Bijou see that her interest in Alex doesn't have to be a betrayal of all that she lost. Opening Lines: "The first time I see her, following Mary Agnes Brady out of Peas 'n Pickles at 3:47 on a Wednesday afternoon in the second week of March, the slow motion thing happens. It's like the pause button's been pushed on everything I see. The image--a beautiful girl with butterfly braids, snapping back the tab on a can of ginger ale--freezes for a millisecond. After the sound of the can's sharp pop and the little breath of fizz that follows it, time stops, and I think, Who is that incredible girl?" Diversity: This may be because the novel is set in multi-ethnic Brooklyn, but there's a naturalness to the diversity here. Many of the characters are from the Dominican Republic, Haiti, or are Japanese American, but that is not really what defines them. Alex never thinks it's a big deal that the girl he's attracted to has black skin. She's just a beautiful human being, with a rich culture. And I loved learning more about Haiti--particularly the Haitian street music called rara. Pitch Perfect Middle School Speak: There were times when I was reading this when I wondered if Josh Farrar had been following 7th graders around with a camcorder (like Alex's friend Ira does.) He captures this particular age's interests and speech patterns perfectly. The Role of Adults: Those of you who are regular readers know that I'm on a mini crusade against the meme of littering the pages of middle grade fiction with the corpses of adults. Sometime middle grade can read like a meeting of Orphans Anonymous. I much prefer when adults are present in children's lives, and can be used to further the narrative. In this case, two of the adults (Bijou's uncle, Tonton Pierre, and Alex's mother) are powerful impediments to the young people's plans to get together. From A Writer's Perspective: A Song for Bijou is first person present, told by dual narrators. This, by the way, is not my own favorite narrative technique--far from it--but if you want to study its successful use, you would be well-served by studying what Josh Farrar achieves here. The choice of dual narratives is perfect, because we see events from such amazingly different cultural perspectives. The first person POV brings out both Alex's and Bijou's particular voices, and the present tense gives the story an immediacy because there's a dramatic revelation towards the end. If you want a comparable title, it reminded me a little of Rebecca Stead's Liar and Spy, in that some essential information is kept from the reader--until the character him/herself is ready to face it. I also love what I call the thematic circle--in which the book starts with that slow-motion image, and ends with it too. I live for these Aha! moments while reading. For me, they are the mark of a master storyteller. The Verdict: A book with a middle grade boy's POV on romance! (There's not that many of them around.) An insight into an unfamiliar culture! There's plenty to smile and laugh about, as well as a moment to tear up over. (Remember, 5-star books for me are those that make me both laugh and cry.) This ranks as one of my favorite reads of the year, and think it would be a popular choice for 5th to 7th graders of both genders. Happy Holidays: This is my last post of the year. Wow--didn't 2013 go quickly?! The Don is off on his annual winter trip to the gaming tables of Vegas, and so he allows us minions to leave the compound and spend time with our own families. I'll be guzzling eggnog, dreaming of Christmas pudding, and looking forward to the arrival of my family from England, who are going to spend New Year's with us in Portland! Thanks to you all for visiting this blog on a consistent basis. I treasure all your comments and interactions. I will be at PROJECT MAYHEM on Wednesday the 18th for a three-book giveaway, so if you have time pop over there. Best wishes and blessings for the coming year, and may 2014 be a year when dreams are realized. Ciao! 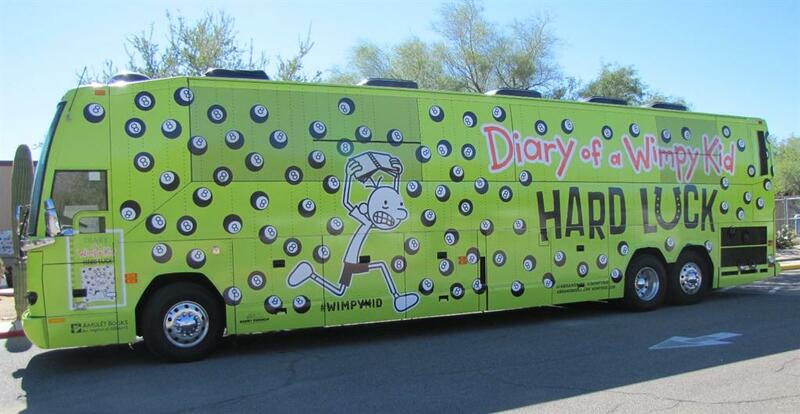 A couple of weeks ago, Jeff Kinney came to town. Fifty fourth and fifth graders from my son's elementary school were invited to meet him at one of our local indie bookstores. My son was thrilled to be one of those chosen. When I asked him why he liked the Diary of a Wimpy Kid so much (we now have all 8 books in the series) he replied that they were funny, and that he felt he could read them quickly. As a reluctant reader, this obviously gave him a strong sense of accomplishment. On the strength of this showing, I decided to read all 8 of the Wimpy Kid books. I found my son was right: I could read them quickly and yes, they were funny. The books are written with verve, and the heavily interspersed illustrations are pitch perfect. 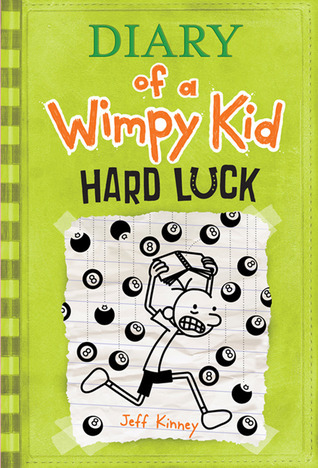 I think Wimpy Kid was the catalyst for the ever-increasing number of these heavily illustrated middle grade series (my son says I must read Big Nate next.) I had the dubious honor of making the woman who was reading Anna Karenina in the tea shop where I like to hang out look at me disapprovingly several times, as I sniggered at something silly. She probably thought "why is that grown man reading such tripe?!" Jeff Kinney told my son's class that there will be two more Wimpy Kid books. What with movies and all the tie-ins, I think I can safely say that this series is a classic.